Denis – It’s an 82 xs650 by the Fong Bros. Still trying to fine tune that same old design. Some items on it include: 16 inch wheels front and back with Shinko tires, foot clutch, hand shift, xs1 front brake,West Eagle seat, TC bros tail, Pamco ignition, LowBrow gas tank, custom handlebars. It has Mac exhaust, and TONS of parts from MIKESXS. Took about 6 or 7 weeks of really steady 4 to 5 hour days to complete. Keeping it fong with the stock peg setup! Love it boys!!! O.M.G!!! I F#CKING LOVE THIS!!! SOLD ON THE COLOUR FOR MY BIKE NOW…THANKS. I’d like to see dual discs up front just to compare it visually to this set-up. Reminds me of Herbie the Love Bug. Killer as usual! Are those bars as comfortable as they look? What brand of bike is that? Looks great shaved, but a shout out to the manufacturer we love is deserved. Another bike with clean lines. Keep it up. Saw this at the timonium show and it looks just as good in person! Love the fat 16’s, the aluminum look paint, the red accents and the filled in cases. Also the more I see of these xs1 front brake set ups the more i like them; Well done Fongs Bros! Will you guys be at the Kundratic swap in April? Nice wheels. Where did you get your spokes for the front 16″ rim? Like the bottom of the tank being level with the ground, and the frame flowing thru it! Also LOVE the lic. plate! Have you guys ever put a rear fender on a bike? Looks really good, but I always felt it looked like something was missing with no rear fender. I always love your tire and wheel choices though…. VERY nice! I’m mystified as to why y’all like this guys bikes so much. Somebody please explain the attraction here as I don’t understand all the rage………. Tyrant, you’re out of the loop, is all. If It’s Not Fong, It’s Wrong (TM). @ Slither302 – You are the random winner for the leave a comment contest.. Nice one.. I send you a e-mail with info on how to get your bar shipped..
Hopefully you have a bike ready to throw your new bars on. Make sure to send in pictures of your xs.. I think so, as long as it’s not a cheap flatty. The only thing I could see that would make it un-fong, would be to use forward controls and lose the stock frame portion that everyone else cuts out. I personally like to see a little space, but I like the Fong bikes too. I’m usually not too picky with things like that. There’s not a right and wrong, it either works or it doesn’t, and although I wouldn’t leave that part of the frame in there, I have to admit it looks right on the Fong bikes. i personally like the stock controls being 4ft on a good day,. Thanks everyone. Here are replies to the questions above. @Slither most likely I will be at the Kundratic show, unless I am out of town. @ El Gaucho – yes, I have used a rear fender on some bikes, but I always end up removing them. Dont know why, I just like to see all of the tire. @Slither congrats on winning the bars. I like many others wanted to win them. @ALF are you near Baltimore? Absolutely beautiful. I want one!!!!! Just noticed you got the B-more po-po waiting for you in the backround, lol. Ohhmygod, this is amazing! What I wouldn’t do to get my hands on that! You would do ANYTHING?? Paint my house! He leaves the top mount off. 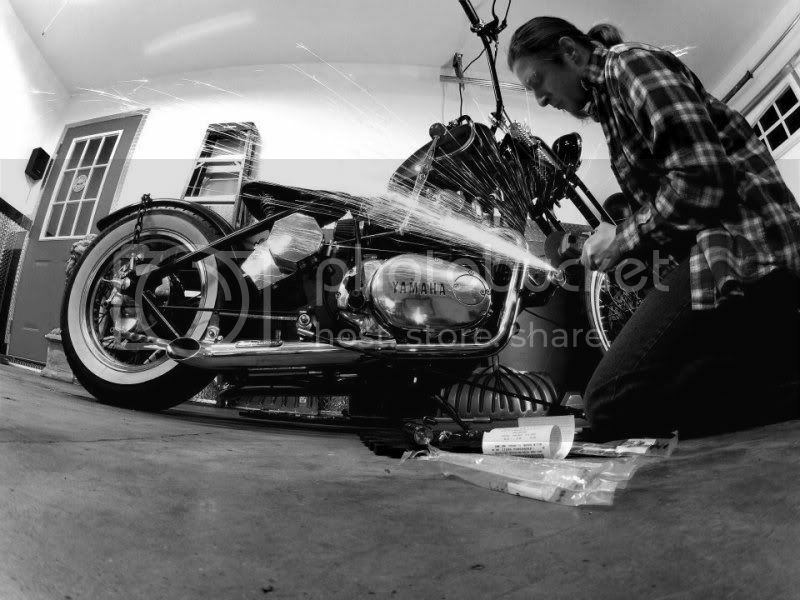 I have the same tank… Do you have the top engine to frame custom bracket on this built?